The Taxi Scrip Program serves low-income King County residents age 18 to 64 who have a disability or age 65 and over. Once registered, you can buy up to eight books of taxi scrip each month from Metro at a 50 percent discount to help meet your transportation needs. You can buy scrip either by mail or in person at Metro's Customer Services Office in the King Street Center building. 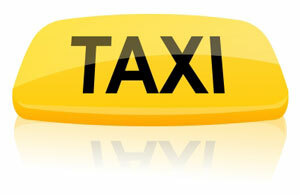 Most taxi companies accept taxi scrip, but you should always check when you call to request a cab. At the end of your taxi trip, you pay the driver the meter fare using taxi scrip instead of money. You do not need to use the scrip the same month you buy it; however, please note that unused scrip cannot be returned for a refund. To register for taxi scrip, you must have a Regional Reduced Fare Permit, be a King County resident age 18 or older, and be low income. For more information on this program, or the Regional Reduced Fare Permit, contact Metro's Customer Services Office at 206-553-3000 (TTY Relay: 711) during regular business hours.